This year is finally coming to a close. Quite frankly this whole year has been on its last leg since July. The best thing we can do is look toward 2017 and hope it is better than this year. Since January is knocking on our door, we wanted to give you a few pointers to saving in the new year. The most popular New Year’s resolution is getting fit and healthy. Right behind that is spending less and saving money. The best way you can do this is by completing a 52 Week Savings Challenge. A weekly savings plan is a great way to keep yourself motivated to save more money. The most common plan that people follow usually works the best. It works by putting away a dollar amount the corresponds to the week that you are in. For example, if it is week one you save $1; then on week two you save $2. 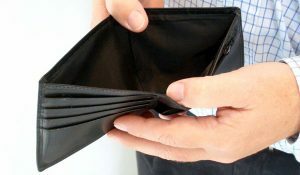 At the end of the year, you will most likely end up with $1378, assuming you do not spend any of the money. While this is a very achievable goal, let’s face it life happens. Many of us have unexpected expenses that will hit us in the head. We have all been in that situation when we had $30 in our account, spent $10 and when we checked our statement we find that there is a balance of $-15. Yes, Apple Music we are referring to the likes of you. So, how do you keep up with a reasonable weekly savings plan? At first, it is a daunting task trying to save all that money each week, but if you stick to your plan you will be successful. So, what is first when beginning your weekly savings plan? The first thing you want to do is carefully calculate all the expenses you have each month. Since the plan is set to start in the first week of the new year, you should start planning in mid-December. Add everything to your monthly budget. Add your car expenses, health insurance, food, recreation etc. Whatever you spend in a month document it so you know how much you will have left over. Many people choose to skip this step and wind up taking more money out of their savings than expected. Often it feels as though we have to fork over hundreds of dollars each month for bills. After, once everything is covered for the month it seems like we only have enough to survive. In turn, we tend to put saving on the back burner. To save there needs to be a certain focus if you want to have a successful weekly savings plan. You need to have the patience to crush your week savings plan. If you have been following the hit FX television show Atlanta, you may remember the episode where Earn, Donald Glover’s character, needed to make some fast cash. There was a lot to this episode including a samurai katana Steve McQueen and a pure-bred Cane Corso. In the end, Earn finds out he would be paid months later when the Cane Corso has puppies. He then makes a poignant comment stating that poor people do not have time to invest. For many of us, we face this problem. Sure, the first week may look extremely dim, but you have to stay the course. Deviation from your weekly savings plan will ultimately end up hurting you. To help alleviate this you should turn saving into a bill that you must pay each week. No exceptions. Just like you would pay your phone bill each month; make sure you add to your savings. Once you have added your money for the week do not look at the balance. Do not let yourself fall to temptation. What you can do is create a separate account strictly for your weekly savings plan. Keep your regular savings and checking accounts, and only take money when you need it from them. How much should you save each week? This is ultimately up to you. You could follow the traditional way; each week you save the amount that corresponds to the week that you are in. This way works well, however, you have a finite goal at the end of the year. Some people may skip a few weeks, or they only add money in during their pay period. Whatever works for you, you should follow that specific routine. We understand that not everyone can save according to the regular weekly savings plan. If you only have $10 to save each week, save it. Ten is better than nothing and at the end of the year you would have $520; still a nice little nest egg. To make it fun you could put varying amounts of money in your savings account each week. This way if you can only save $10 on week 37 it is ok. You could also save large amounts on certain weeks if you earned some extra cash. For example, say you find that you have an extra $200 on your paycheck; instead of spending all of it save half for a rainy day. Then you can use the other half for your weekly savings plan. Make next year the year of saving. 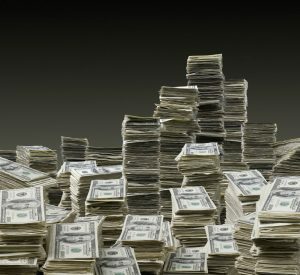 Finally, just to wrap this up, Jeffrey over at savingadvice.com has two great postings on the 52-week money challenge. 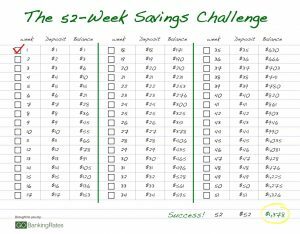 The classic 52-week money challenge and alternatives to the classic 52-week money challenge. Check them out if you get a chance.